While it might be the dress that you and your guests remember the most, it’s the finishing touches to a wedding dress that make it stand out. After all, it’s your wedding day, so you’ll want to make it count by looking out of this world. Accessorising your dress is an easy way to personalise your bridal look without any costly alterations. Think of the wedding dress as the star of the show, and wedding dress accessories as the finer details that bring the whole thing to life. We are spoilt for choice with the amount of wedding dress accessories out there. But that can make it difficult to know what to go for. So to make it easier, we’ve compiled a helpful guide on our tried and tested wedding dress accessories. If you’ve never thought of wearing a jacket over your wedding dress, this bridal accessory is definitely worth considering. An elegant jacket is ideal for creating layered detail or looking stylish while staying warm during winter weddings. Throwing on a bridal jacket is also the perfect way to change your look throughout the day without needing a rushed outfit change. They can be the subtle change you make to your outfit from your wedding ceremony to your reception. Keep it classy with a jacket and dress ensemble for your day service attire, then lose the jacket for your post-ceremony party. Two different looks, from one dress! The secret to pulling off a bridal jacket is to choose one that complements both your wedding dress and your personal style. But keep in mind, complementing does not mean that your bridal jacket has to look the same as your dress. Mixing up materials, patterns and contrasting details are great ways to add interest to your bridal outfit. Simple, minimalistic dress styles can be paired with more embellished cover-ups. Think beaded capelets or lace bridal jackets in geometric patterns for a futuristic Gatsby look. For more elaborate bridal dresses that have a lot of detail from beads, sequins, pearls or lace, opt for simple, yet elegant jackets. A delicate lace jacket, simple bolero or structured silk jackets will keep you warm without competing with the detailing of your gown. Want to add a little something extra to your dress but looking to keep it modest? Bridal tops and toppers are a subtle addition to transform your look. 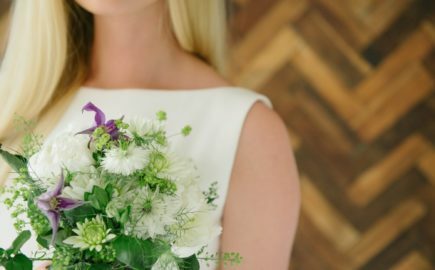 Bridal tops often appear as part of the wedding dress, making it easier to add depth to your dress without feeling that you are adorning loads of constricting layers. Mix and match your wedding dress or bridal skirt with an enchanting bridal top or topper to add an extra layer and texture to your bridal outfit. Pairing a detailed or opaque wedding top with a simple wedding dress or camisole silk top can create an elegant, clean bridal look. Lace detailing adds a romantic element to your look, while a more detailed sequin or glass bead top can enhance a simplistic wedding dress. The statement-making kind of cape, bridal capes are a fantastic way to enhance your wedding dress while staying away from the traditional wedding veil or a jacket. They guarantee you a stunning entrance at your ceremony –– imagine you walking to the altar looking breathtaking, with a gorgeous cape flowing behind you like you’re walking on air. It can make the most dramatic and magical entrance. The best news is, they come in all shapes, sizes and styles to suit every kind of bride. From the whimsical to the ultra glamorous, there is a cape for you. A flowing, lace bridal cape or a full-length tulle cape can immediately make your bridal look that bit more unique while staying elegant and minimal. Capes embellished with beaded and sequin details add an enchanting touch and can complement a simple dress. Don’t be afraid to go all the way on the dramatic side –– if you have an intricate dress, there is nothing stopping you pulling off an equally detailed and ornate bridal cape. If you’ve dreamed of a stunning twirl, a bridal overskirt is the answer to creating your show-stopper bridal look. Overskirts give you the versatility to pull off two completely different looks, all from one wedding dress. Lots of overskirts are designed to be removed, meaning that you can seamlessly transform your wedding look at any point during the day when you feel the need to switch things up, such as when you go from your ceremony to the dance-floor. Bridal overskirts are also excellent for mixing styles or adding a dramatic finish to your dress. Opt for a longer train on the overskirt to add a captivating element to the dress, then go for a shorter train on your wedding dress for ease later on. Make it interesting by combining a short tea length wedding dress with a breathtaking voluminous overskirt for added flair. Or go against traditions by trying an open front overskirt with a bridal jumpsuit. Be creative! Adding a belt to your wedding dress is an easy yet subtle way to draw out your curves or give your figure a lot of definition. By accentuating our waist, a bridal belt can enhance the feminine look of your wedding dress in a matter of seconds. Just because your wedding dress isn’t designed with a belt, doesn’t mean you cannot add one to the look. Add an embellished belt to add interest and sparkle to your dress –– think classic pearls, matt sequins and the sparks of glass beads. While simple belts using materials such as silk can draw attention to your curves without detracting attention from your dress, subtly highlighting your figure. This iconic wedding dress adornment has been reworked and reimagined in so many creative ways that it’s hard to not find a veil design that you’ll fall head over heels for. From ethereal cathedral-length veils to fun birdcages with retro elements, there is no shortage of styles to choose from. The veil is the traditional bridal accessory, but nowadays it’s far from stuck in the past. First things first, decide on the length you want to go for. Are you going to go all the way and opt for a floor-sweeping cathedral veil that requires a team of bridesmaids to carry? Or are you going to go for a shorter style such as a ballet veil, fingertip or shoulder-length option, or even a bandeau veil? Once you know the length of your veil, you can start deciding on the material, if you want any details such as delicate lace patterning, and if you want it to be double layered. If you’re unsure, ask us for advice on what styles to try first! Creating a complete and unique bridal look is a process that has to be tailored to each bride, as each wedding dress should be as individual as the wearer. Interested in experimenting with some wedding dress accessories? View our stunning collection of silk and lace wedding dress accessories for plenty of ideas and inspiration.